Join us for our Kids Halloween Party on Monday 29th October from 6.00 – 8.30pm. 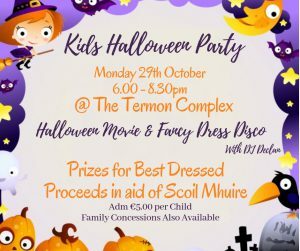 There will be a fantastic Halloween Movie, followed by a Fancy Dress Disco with our very own DJ Declan. Prizes on the day for “Best Dressed”. All proceeds from the event will go to Scoil Mhuire National School. 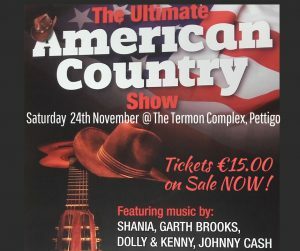 This fabulous show features music from Shania Twain, Garth Brooks, Dolly & Kenny, Johnny Cash and other greats. This is a show not to be missed. Doors open at 9.00pm, Tickets ON SALE NOW ! 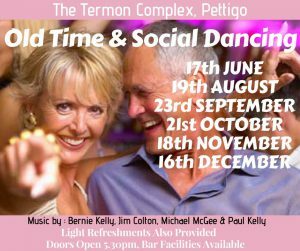 Get out your best frock and dust off those dancin’ shoes for this years Christmas Party here at The Termon Complex on December 15th. 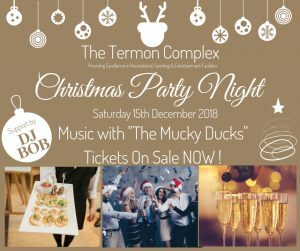 Enjoy a night of sumptuous food and dance the night away to music by the fantastic Mucky Ducks supported by out very own DJ Bob. This promises to be a fab night so don’t miss out, get in early and BOOK your TICKETS NOW !